The best way to see England’s Jurassic Coast is undoubtably from the sea. We found this out on a boat trip from Sidmouth, Devon, with Stuart Line Cruises. This was one of the highlights of our caravan holiday in Seaton, East Devon, which was a press trip arranged by Visit Seaton. You join the Sidmouth Bay Cruise on Sidmouth beach opposite the Bedford Hotel where the boat runs onto the shingle beach to pick up its passengers. The Pride of Exmouth is designed for this purpose and has a gangway at its bow which you walk up, avoiding dipping your toes in the water. Onboard you can sit at tables and chairs below deck or go onto the top deck, like we did, and sit on benches. These were covered in blankets to save our legs from what would have been hot mental benches on scorching day. Sidmouth and the Devon cliffs and beaches surrounding the town make up an extraordinary part of the Jurassic Coast UNESCO World Heritage Site. The Jurassic Coast was the first natural world heritage site to be designated in the country. It stretches from Exmouth to Poole in Dorset. If you love epic landscapes or geology then this is the excursion for you! It was a real highlight of our stay in East Devon. We’d recommend it for families interesting in exploring the coastline but not necessarily on foot. As the boat trip from Sidmouth was less than an hour long we were able to keep our girls (aged three and five) amused and reasonably un-fidgety. There was also the promise of some beach time for them when we returned to Sidmouth. Dogs are allowed onboard which is something that made this boat trip from Sidmouth really easy for us to do. While Tin Box Dog isn’t the biggest fan of boarding anything that moves (trains, boats, buses), it was a relief to be able to take her with us. The boot of the car would not have been an option in the summer heat! There is a bar on The Pride of Exmouth but there’s no need to get up from your seats to purchase a drink or ice cream. The crew come around to take orders from the menu once the boat is underway. This is ideal as you can continue to enjoy the views and commentary rather than queue. The prices are reasonable: £1 fr a tea or coffee; 50p for squash; £1.50 for bottles of soft drink; and alcoholic drinks ranging from £3 for a bottle of lager to £4 for a 250ml glass of wine. The girls enjoyed a tub of ice cream for £2.50 each. Tickets for the Sidmouth Bay Cruise can be bought online or on the Promenade at Sidmouth. Staff are there an hour before the cruise. Boat trips from Sidmouth and the other Stuart Line Cruise pick up points are weather dependant so may be subject to cancellation. 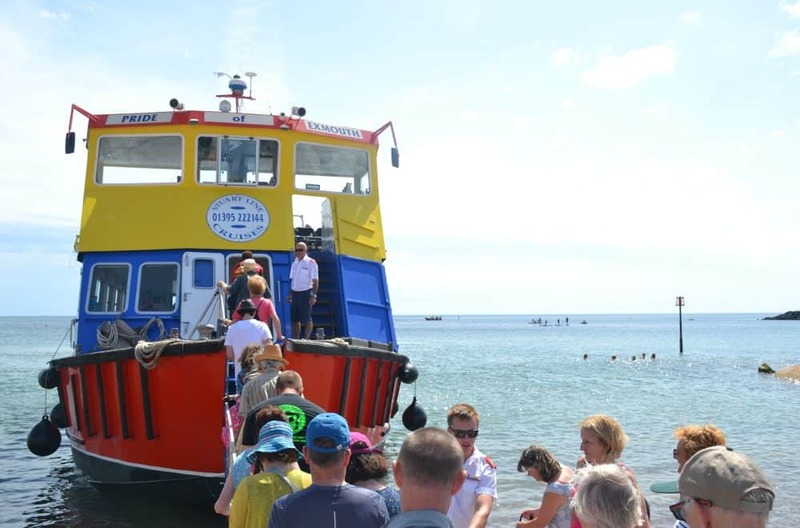 Tickets for the Sidmouth Bay Cruise cost £7.50 for adults and £5 for children. There’s no dedicated parking for Stuart Line Cruise customers at Sidmouth. So seek out one of the pay and display car parks in the town or a two-hour on-street parking spot. We’d recommend staying for longer than two hours though as there’s plenty to see in Sidmouth. 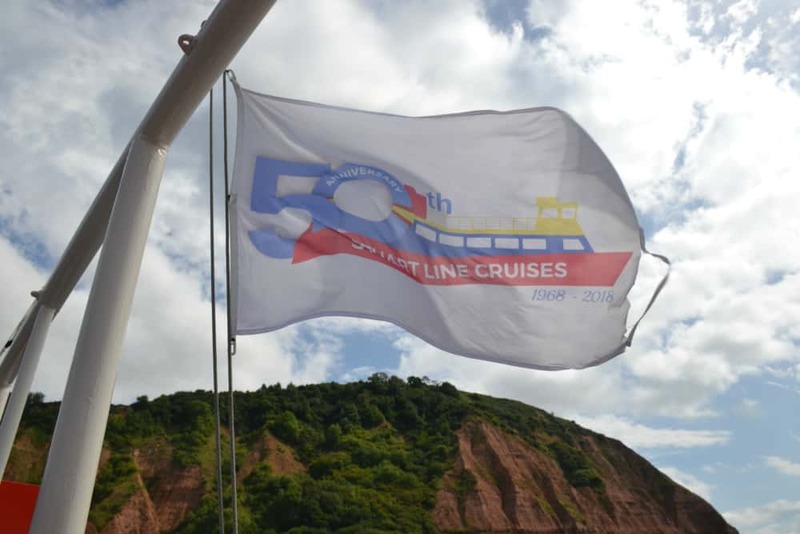 Stuart Line Cruises offer trips all along the red cliff and sandy Devon coast from Sidmouth to Brixham. There are day trips, themed nights and parties, and the all important Santa Sailings in the winter months. Find out more about all the options on the Stuart Line Cruises website. If you’re looking for more inspiration in the area then take a look at these tried and tested things to do in East Devon and seven things you must do when staying in Seaton. Disclosure: we received a free trip with Stuart Line Cruises as part of our press trip with Visit Seaton. All opinions are my own and those of my family. I’ve been hearing great things about Devon and SW England especially the growing wine industry. Looks like in between winery visits you can get out on the seas and take in some stunning scenery. Thanks for sharing.